People did mistakes over and over when they are doing E-commerce SEO. As the competition increases in the field of E-commerce, you must think deep down to increase online presence, traffic and sales. In this article, we take you through the step‐by‐step, noob‐friendly guide of SEO for E-commerce Websites in order to increase your online store’s Google traffic and drive more sales. Well, there are a lot of hinders while developing an E-commerce website and this hassle does not ends here. While running a successful E-commerce store there are certain strategies need to streamline and executed in order to stand in a competitive market. 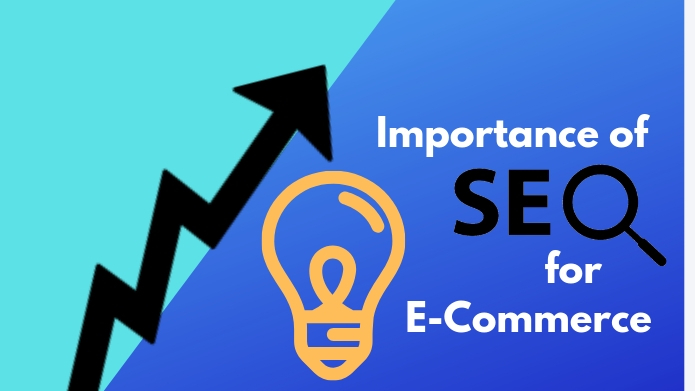 Being an owner of the E-commerce website, you might be thinking of accelerating the business to gain more profit from it but, without much of a background or accurate knowledge of SEO tips or SEO for E-commerce Websites, that will get your e-commerce site to the top – you may loose. Keep in mind that to achieve success, ranking higher than your competitors on Google is must, where SEO plays a great role. Importance of SEO for E-Commerce Websites? If you finish with your developing part and have a stunning, visually appealing, easy and efficient to navigate website which is stocked with well-priced goods that are in demand, then you need to step forward towards the search engine optimization – SEO for E-commerce Websites that will offer some of the best return on investment. As we know, SEO helps in organically improving the rankings of your website in search engines such as Google, Bing, and Yahoo. Considering the E-commerce field, approx 44% of online shoppers begin their search with a search engine. According to the Department of Commerce, e-commerce sales are increasing every year. We recommend to keep an eagle eye on SEO strategies, from technical SEO, fixing meta, or opting for off-site support, to target consumers online with whatever excites them. It’s all SEO. Follow below tips while working with your e-commerce website. Research includes in both, for structuring your website content i.e Keyword Research and for targeting these Keywords effectively to stand in niche market i.e Competitors Research. Of course, targeting the wrong keywords can ruin your conversions and generates low-quality traffic. SEO for E-commerce Websites slightly different, while conducting keyword research you need to focus on the homepage and product pages first. Note* Consider local search volume, not Global, also choose less competitive keywords. Moreover, Don’t look for an exact number or percentage that defines an ideal “keyword density” as there is no sweet spot. You should make sure your keyword research is on point before you hop into writing any content. Also, you can capitalize on long-tail keywords in your website. Now the other points to remember while performing SEO for E-commerce Websites are – avoid keyword cannibalization which means when you have a multiple page website and those pages target the same keyword this occurs problem for search engines or confusing to the search engines. As a result, you loose the amount of traffic which you expect by those keywords. Find Their Keywords and density. In order to check all the above matrices, there are plenty of tools that may help you to collect the strategies of your competitors. Despite the fact that SEO has the highest ROI of any E-commerce marketing campaign, Most owners are unable to organize their site. 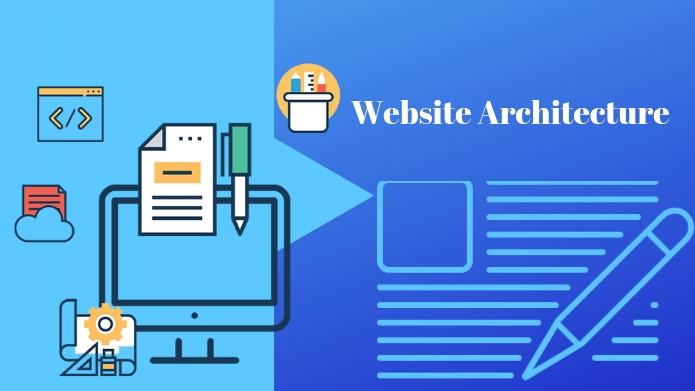 As we know that, E-commerce websites have millions of product pages and a clean website architecture crafts a compelling user experience for potential customers who visit your E-commerce pages. isn’t it? If you create a bad user flow experience, you may hurt your SEO. We recommend to do a complete site audit which results in finding the website errors, you can use Screaming Frog tool for this, which is free to use. When there is the issue of time-saving or smart work, the Screaming Frog is the best SEO tool to which crawls websites’ links, images, CSS, script, and apps from a quick SEO perspective. 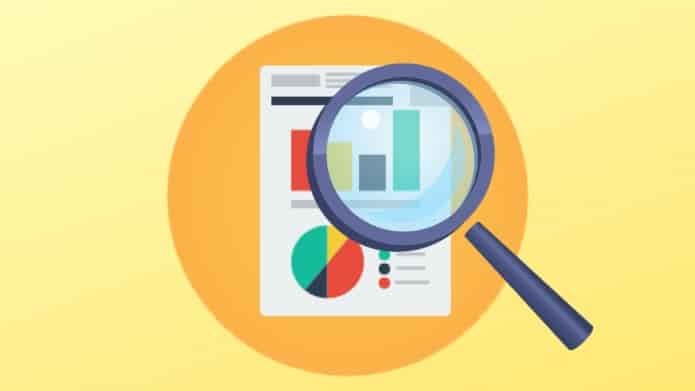 So, with the help of this tool SEO experts and agencies can track the competitor’s sites, analyze their data and get a broad overview. This tool will provide you a summary of data including errors, redirects, duplicate pages, missing header tags, and etc. Once you have done with finding these errors, check your website speed, Mobile Version of your site and do required changes if needed. Note* It is proven that optimizing your sites’ speed is one of the most affordable and highest ROI providing investments. So, Perform in-depth website speed optimization. Social Media Integration: Social media is the heart of promotions, it helps to entertain people and spread awareness of your brand. It can boost your E-commerce site. As we know that engaging with customers and sharing content on social media impact your SEO. Performing an effective SEO for E-commerce Websites, both on-page and page SEO are important. 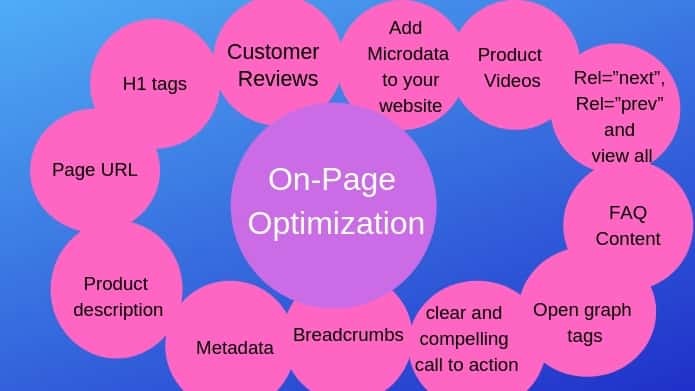 On-page optimization includes optimizing page contents and code elements, the practice of optimizing individual web pages in order to rank higher and earn more relevant traffic in search engines. On-page refers to both the content and HTML source code of the page that can be optimized. Customer Reviews: WoW! how amazing it sounds when someone says this thing is just WoW. Similarly, online shoppers emphasize on reviews before purchasing the product. So, it is very important like water after the meal. Collect customer reviews, that not only influence your customers it also gives great feedback to you in order need improvement in your business. We recommend using any system that automatically emails customers a few weeks after purchasing or use any other service that will help you to send emails to your customer and ask for a review. Add Microdata to your website: Microdata is “hidden HTML code” also known as structured data or Schema Markup code, which can be inserted in web pages to help search engines for the better understanding of website content. Major search engines like Google, Yahoo, and Bing use Microdata to help better understand website content in order to provide the best possible results for search engine users. Product Videos: No doubt every corner of the internet have been dubbing video the most important emerging trend in marketing, similarly Video’s plays a vital component of every E-commerce brand’s marketing strategy. Add the product videos to your website in the most optimal way. If you stuck anywhere use few optimization techniques for your video. FAQ Content: FAQ stands for “frequently asked questions” and an FAQ page is often included on websites that lets your site visitors to ask questions in a public forum. Well, this is the great work that leads you towards answering customer queries. It can be a powerful yet simple and quick way to bring benefits to your E-commerce website. Add Open graph tags: “Be active and careful in whatever you are doing and testing with your site being a newbie” So, adding the open graph tags helps you to reach a wider audience. These tags boost your social media returns, increase click-throughs and attract more targeted traffic. Breadcrumbs: Breadcrumbs helps in navigating the user. These are horizontally arranged text links separated usually by the “greater than” symbol (>) and are really important to e-commerce because without them sometimes it is difficult for the user to easily browse. Metadata: Metadata is data information, that provides information about other data. In the source code of the website, each page contains a space between the <head> tags to insert metadata or information about the contents of your page. you should place the correct information in title description and keyword Metadata targetting your content. Title Metadata: Title metadata is responsible for the page titles displayed at the top of a browser window. Description Metadata: Description metadata is the textual description that a browser will use in your page search return. Keyword Metadata: Keyword metadata are the search phrases that people type when they want to find your page. Product description: Use relevant, descriptive, unique and simple product description on your site that catches the eyes of the visitors of your website. Page URL: By keeping in mind that you are running an E-Commerce site do not include categories or sub-categories in product URLs. All you need to do is use product name and code as the URL. H1 tags: As algorithm updates continue to emerge, you need to update your old SEO strategies. As far as H1s are concerned, H1 header tags improve a website’s SEO tremendously. For an eCommerce product page, I’d recommend code the page template so that the product name automatically becomes the default H1 tag for a page.